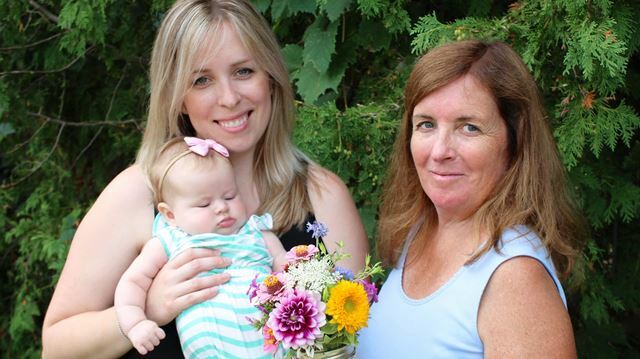 Debbie Gordon (right), daughter Amanda Mallory and baby Lucy make Cloverhill Flowers in Georgina a three generation family affair and small-scale sustainable farm, offering arrangements at the farmers market in Sutton and by order. Aug. 23, 2016. Flowers have always been nature’s way of smiling, but you could call some blooming in Georgina as being downright environmentally friendly. They are also a three-generation family affair for Debbie Gordon, daughter Amanda Mallory and baby Lucy, who all have a green thumb, as well as a hand, in the new venture Cloverhill Flowers. “We are trying to be as sustainable as possible from field to vase,” Gordon said of the small-scale flower ‘farm’ based at Cloverhill — a century home built in 1903 that is being restored by Mallory and her husband. Prior to having children, Gordon worked full-time as a floral designer and her daughter’s one-acre property in the country seemed like a great opportunity to revisit the art again, with a second eye trained on sustainability this go around. Bouquets and arrangements from the hand-picked flowers grown from non-GMO seeds and using re-purposed organic coffee bean bags are now available at the farmers market at The Link in Sutton, which runs every Sunday until the season wraps up mid-September. If farm fresh and locally grown isn’t reason enough to pique your interest, the arrangements all come with one-of-a-kind, hand-crafted pottery vases specially designed for Cloverhill by local pottery artist Barbara Banfield. To date, Cloverhill has taken some custom orders for parties and weddings. Pre-orders for pumpkin arrangements similar to the ones Gordon made, and sold out of in less than 24 hours last Thanksgiving, will be taken again this year. A portion of all flower sales is also going toward a long-standing environmental issue Gordon has been passionately committed to rectifying for decades. A long-standing member of the Thane public liaison committee, Gordon filed a judicial review last year of the Ministry of Environment and Climate Change’s July 2014 decision to revoke a cleanup order on the abandoned Thane smelter property on Warden Avenue in Keswick. “I asked for legal help from Ecojustice because I believe it is important that the public be kept informed about how the ministry makes these decisions,” Gordon said, adding “it isn’t fair when the ministry says it is going to follow a transparent process for cleanup and then decides behind closed doors that the environmental rights of Georgina residents are not a priority”. Ecojustice, Canada’s only national, entirely donor-funded, environmental law charity has been working pro bono on the issue. While roughly $60,000 in legal fees are being covered, Gordon is still required to pay what most likely will amount to a few thousand dollars in disbursement costs. For more information, check out Cloverhill Flowers on Instagram and Facebook.